This dolly is ideal for all day every day use. The 5x2 casters allow for a 1600 lbs capacity while compromising none of the easy rolling over uneven surfaces. This dolly is still lightweight and fast to use. 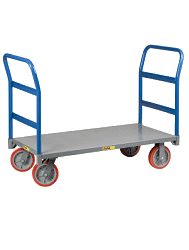 It also boasts the same signature roll cage steel Anderson Dollies are famous for. This is one tough, versatile dolly. 1: Simply place one half of dolly system on opposing flat sides of the object to be moved. 2: Stretch the straps across and hook them through the eyebolts. 3: Tighten straps until snug. Lifting occurs automatically. 4: Move the object to the desired location. 1: Depress the ratcheting lever on strap and open handles completely wide Note: wheels will slide back and object will drop. Give the dolly some extra room, and keep hands and feet out from under the dolly/object. 2: Unhook the straps from eyebolts. They will retract automatically. 3: Remove dolly sides from the object you’ve moved.